Today, Michael and Mark are discussing Superman: Lois & Clark 1, originally released October 14th, 2015. Michael: Many of my early pieces for Retcon Punch consisted of me complaining about The New 52 and comparing it to the old DCU that I knew and loved. I’d often go off on tangents about the way DC does business and neglect the book I was actually covering. I loved and missed the pre-Flashpoint DCU and I still do. Enter a book like Superman: Lois & Clark 1, which allows me to cheat by writing about the old DCU and the book in front of me. So far Superman: Lois & Clark is giving me the same mixed feelings I had when I began reading some of the Convergence tie-ins. On the one hand I am overjoyed to be reading the old Superman and Lois Lane that I knew and loved. I enjoyed reading Lois’ internal monologue/diary as she witness the foreign events of The New 52 unfold. It was an unexpected comfort — like talking with another DC fan about how different things were from the universe we had grown to love. This was by no means a great comic book, but it was very hard to suppress my personal feelings as I read Superman: Lois & Clark 1. I can tend to be hard on Dan Jurgens’ scripts — at least when he’s trying to write in a voice that’s different from his own. But like the Convergence: Superman tie-in that he wrote these characters in, it’s probably a good call to have a veteran like Jurgens at the helm. Jurgens expertly manipulates my fanboyishness by having the characters in the book comment and compare worlds in the same way I would. I’m ashamedly I’m a sucker for that kind of referential/Easter egg comic writing — even in instances where it’s as subtle as a bulldozer. But those kinds of referential “winks and nods” are only sustainable if the rest of the story has a strong foundation. It’s too early to tell if the series itself will have that kind of durability — hopefully Jurgens will try to give Lois and Clark a destiny that is more focused on the “now” instead of the “then.” Superman: Lois & Clark 1 is very referential and premise heavy because it kind of has to be. The only potential seeds planted for future issues are in that vague oblivion stone scene, Lois’ Intergang expose and Superman’s rescuing of this Earth’s Hank Henshaw. I know that once you start nitpicking at the real-world particulars of a comic book, then the whole thing unravels. And while I loathe “realism” in my superhero stories, I couldn’t help finding myself asking Jurgens a few questions about Lois and Clark’s “off-the-grid” life. Just like with any Superman origin story, the whole U.S. government/social security conundrum of their new identities raises some questions. Do we know exactly how Clark supposedly earns a living? In the wake of New 52 Superman’s identity being exposed, Supes counts his blessings on changing their name from Kent. You really think that a name change and a beard is good enough? I guess it’s pretty equivalent to a pair of glasses and a spit curl though. Sporting an “S” shield while he’s off doing his secret good deeds is probably ill-advised as well. 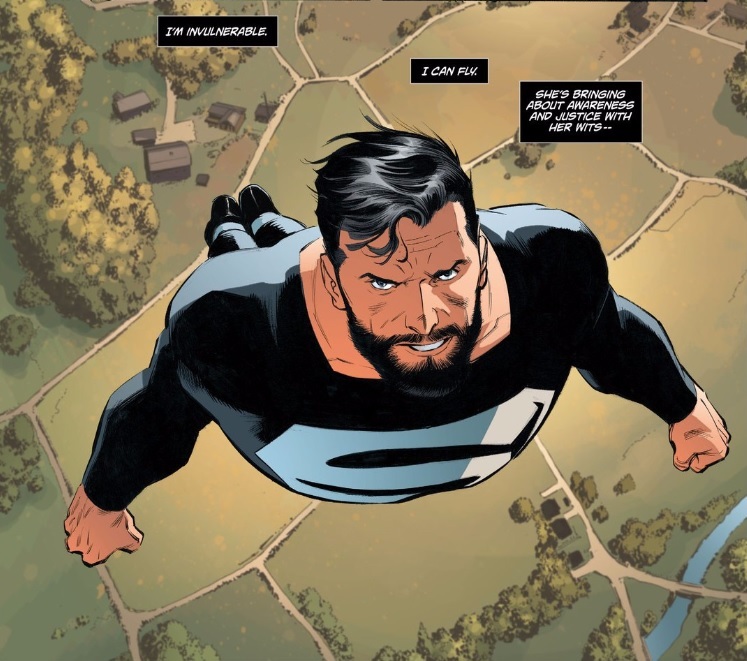 Nevertheless, Jurgens and artist Lee Weeks do indeed give us the Superman of old. I kind of love the idea of Superman averting natural disasters and extraterrestrial threats without anyone knowing. In addition to having the flavor of some of his pre-cape adventures, these kinds of selfless acts embody just the kind of hero that Superman is — no fame, no glory. Lee Weeks delivers this classic Superman with his classic costume — simple and humble, unburdened by any complicated, detailed pieces of armor. And while I am itching for this Superman to eventually come face-to-face with the heroes of this world, I can wait. For now, I’ll settle for quiet moments like Superman stressing about not being able to use his powers to make his family’s life simpler. What a guy. Brother Mark! How did this issue treat you? What do you make out of Henshaw’s rescue? Do you think that we will spend a lot of time with little Jon uncovering the truth/does that really matter? Also, did you notice that one of the variant covers for the issue was a blatant reuse of a cover from the abandoned Andy Diggle/Tony Daniel Action Comics run? The opening half of the issue shows a lot of promise. 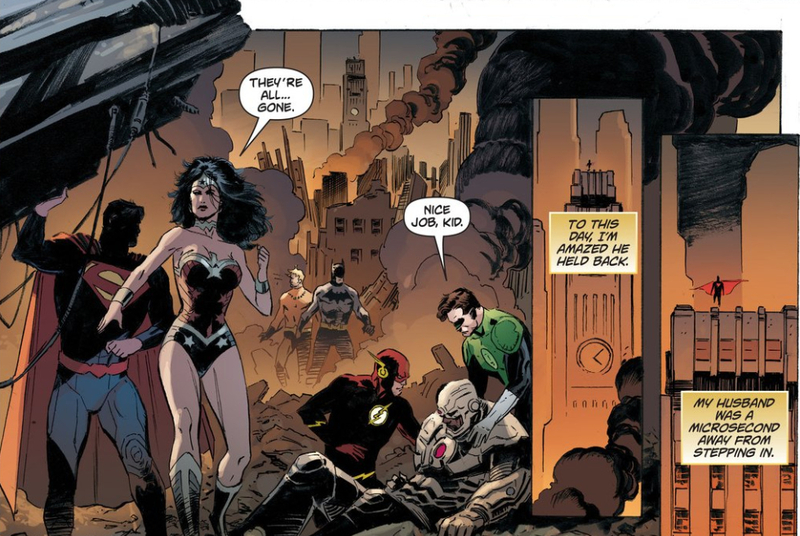 I really like the opening pages where our Superman watches the events of Justice League: Origin from afar. And frankly I’d read an entire book that is just Superman saving the world in secret, trying desperately to not step on the toes of the New 52’s Justice League. I’m less sold on the second half. Michael, it seems like Clark doesn’t have a regular, punch-the-clock day job at all. I think he works the farm when he’s not saving the world. My read is that the majority of their income comes from Lois’ books. How does any of this work in practical terms? I don’t know. It doesn’t really make a lot of sense, but I agree there’s not much merit into trying to puzzle out the realistic details of a comic book world. Jurgen’s also seems to be a teasing a mystery about fluctuations in Superman’s powers… and I just don’t know how much I can care about yet another Superman having yet more issues with his powers. And I guarantee I don’t care about Jon uncovering the truth about his dad. At all. But honestly, for any misgivings I have, it’s enough for me to have my favorite version of Superman back in DC’s continuity. Yeah Mark, I’m with you in having zero interest about a plot about Superman “losing” his powers. If Jurgens uses the plot device to say something interesting about Superman, then I’m cool with that, but so many writers seem to use “fluctuating powers” as this big drastic plot point (“why is it happening!! !”) and it’s just boring as sin, especially because it generally tends to go nowhere. Remember in Robinson’s Justice League when there was a “plot” about Jesse Quick’s powers fluctuating which mostly consisted in Jesse mentioning that her powers felt strange once an issue, then eventually realizing she could only use her speed when she flew, not when she ran (this didn’t seem to change her combat style or capabilities at all), and then realizing that her power fluctuations were being caused because she was pregnant? And then the universe ended and the pregnancy went nowhere? I generally drink to forget. Yeah, that’s the kind of pointless story power fluctuations always brings to mind to me. 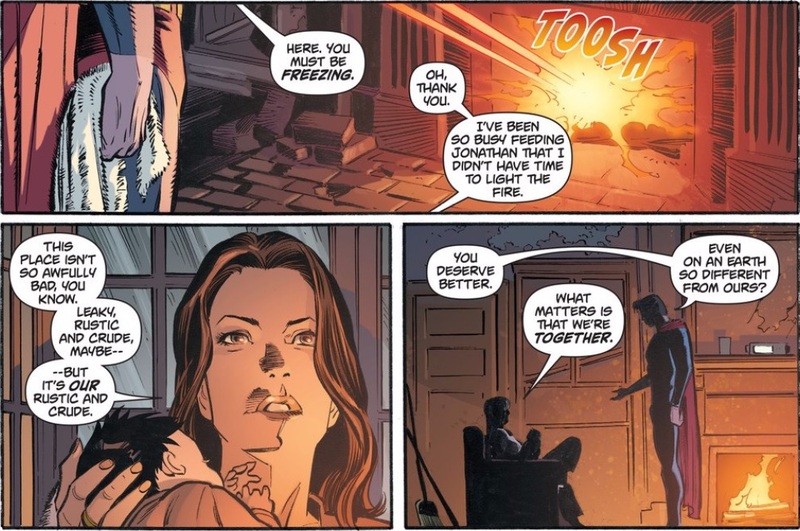 But like you both, I found a good bit of this issue to be sweet and interesting, I just wish we could see this version of Lois and Clark in their own continuity, or at least one separate from the New 52. C’mon, pull a Spider-Gwen!